Over the past few years, I’ve been fascinated to understand how culture and environment shape our point of view. How they’re applied in our early years both enhances and distances us from the essence of who we are. Mirrors help us see what’s there, and then it’s up to us to use the reflection for our own best interests and personal growth. Excerpt from Life Lessons from Motorcycles—75 Tips for the Face in the Mirror. Through the experiences of your past, mirrors teach life lessons and shape your point of view. But focus on them too much and you miss the present and risk the future. Without saying anything, mirrors convey a loud message. Without doing anything, they help keep you safe from harm, as long as you’re open to their message. They shape your point of view in ten important ways. Add perspective. A motorcycle has two mirrors to capture images from both sides. Both mirrors are necessary to get enough information on which to make a decision. You need to view things from more than one perspective to get the most accurate picture in life as well. Although reality is always changing, you make the best decisions when you can get as many facts as practically possible. Affect perception. The image you see in the mirror is not the actual size. It’s the same when you look back on life experiences. Time has a way of embellishing events. Your mind makes them smaller, larger, more painful, or more difficult than they really were. A quick reality check can correct that. Teach change management. Each view in the mirror is but a single snapshot, and it’s dynamic. Experiences and people come and go. Time flies. New inputs take priority over older ones. 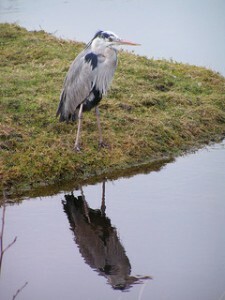 Mirrors teach you how to be flexible and manage change. Create distortion. Dirty, foggy, or sooty mirrors distort what you see, preventing a clear picture from forming. This is akin to negative thoughts and emotions that drag you down, usurp your energy, and jeopardize your progress. Stop and clean them. It’s amazing how things change. Aid hazard recognition. Mirrors show you hazards that are approaching from behind. Presumably, you recognize them and can take corrective action before harm occurs. In life, ideally you only need a particular lesson once, and you recognize it if it happens again. Learn from the mistakes of the past so that they don’t need to be repeated. There’s too much else to do. Require repetition. It’s not sufficient to check your mirrors at the beginning of your journey and then not again until the end. Because of the ever-changing nature of our past, checking them frequently keeps us sharp and ready to take appropriate action. Offer limited usefulness. Mirrors reflect only what they’re focused on. Much of what’s going on around you isn’t captured and can potentially influence your life. Likewise, if you focus only on one aspect of your past at the expense of a much larger experience, you act on incomplete information. And that leads to trouble. Reward mindfulness. A cursory glance in the mirror does very little. Although you’re going through the motions, you’re not seeing what’s there. Mindfulness keeps you receptive and safe. Balance needs. Motorcycle mirrors must be large enough to capture as much information as possible but small enough to be aerodynamic, light, and practical. You’ll never understand everything that happens. Realize that there’s too much to comprehend, take what is practical, and then respect and park the rest. You’re not meant to understand everything, and trying only keeps you in the past. Increase accuracy. With technology and enhanced manufacturing processes, mirrors are increasingly perceptive. Often, as people get to know you, they become more astute, and the messages they send back become more valuable to you. Mirrors help shape your point of view. Life gives you all kinds of experiences—many pleasant and joyful, others you’d rather forget. They all serve a purpose on your journey. But if you get embroiled in the past, you miss the opportunities and gifts of present moment and risk your future. Mirrors teach you how to honor the past, learn from it, and carry its lessons into your future. 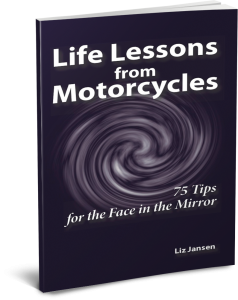 Purchase the entire ebook Life Lessons from Motorcycles—75 Tips for the Face in the Mirror available for any e-reader. $2.99. i find this so interesting that I re-read it periodically, Thank you Liz.